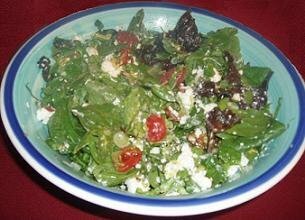 This salad is the kind that is layered up, rather than tossed or bound, as this would make it soggy. It is very simple and takes very little work to produce a dish that is absolutely stunning. Thanks to Peter Gordon, on whose original recipe this is based. To begin, the goat's cheese must be crumbled into nice big chunks. The grapes should be chilled in the freezer in advance and slices lengthways when ready to assemble. The spring onions should be finely shredded and the dates destoned and roughly torn. Medjool dates are amazingly sweet compared to the bland sort you often see at the Christmas table. The olives should also be destoned and thinly sliced widthways. The cashew nuts should be left whole. The only two ingredients in the salad that need any real preparation are the tomatoes and the bacon. With the tomatoes, remove the eyes while whole and make a shallow cross with your knife on the opposite side. Plunge into rolling boiling water and remove after five or six seconds into ice water to refresh. Gently peel the skins off using the knife and cut in halves. Cut each half into halves again so they look like petals, which is what they are now called. Remove the seeds and leave whole. The bacon must be streaky, because the fat is what makes the bacon go crispy when fried. The rashers should be cut into lardons, or small strips and thrown straight into a hot frying pan strictly with no oil or butter! The bacon already has enough fat, which will seep out immediately. This white liquid will evaporate within a minute or two and leave the bacon to fry in a dry pan until crispy. When ready, place onto kitchen paper to absorb up the excess surface fat. The dressing is as simple as it gets, start with a blob of honey in a bowl and slowly whisk in freshly squeezed lemon juice until the sweet/sour balance is correct to you own taste. Now you are ready to start assembling the salad, which is totally up to you. I start with a layer of the leaves and then keep layering up with the other ingredients in turn. To finish, drizzle with the dressing when you are ready to serve. Voilà!